America Movil's Simple Mobile, which uses the T-Mobile network, revamped its plan lineup today. There's a new $25 30 day plan that includes unlimited domestic voice and unlimited domestic and international texting but no data. After the high speed data is used up, the $40 and higher plans get unlimited data throttled to approximately 256 Kbps. All plans include unlimited domestic voice and unlimited domestic and international texting. The international plans also include unlimited calls to international landlines in 47 countries and to cell phones in China and India. Although international minutes are advertised as unlimited, users can only make calls to 10 unique international numbers per month. $25 20 day plan? Thats different. Oops, typo! It's a 30 day plan. @Dennis Bournique: You have a typo. "20 day plan" should be "30 day plan". 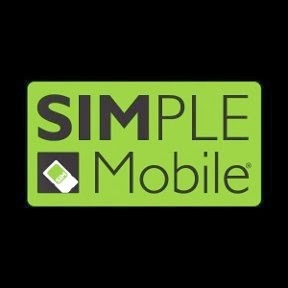 Does Simple Mobile still use only T-Mobile network, or got AT&T included like other America Movil brands? They seem to provide options now for AT&T or T-Mobile compatible phones while selling SIM cards on their web site. Yes that's very confusing. But I'm pretty sure it's T-Mobile native network only. When you select "I have an AT&T compatible phone" when ordering a SIM on the next page it says "You will need a compatible GSM T-Mobile phone or an Unlocked GSM phone compatible with T-Mobile." The coverage map shows T-Mobile native coverage only and phone programming instructions use T-Mobile's MNC and MMS proxy. is the data in the new $40 1-gigabyte plan divided into two 500-megabyte halves that you have to call CS after using up the first 500-megabytes to get the second 500-megabytes half? Not on Simple, only Airvoice partitions their data. so if you get this on sale at calling mart its probably 23.50 right compared to 28.50 for airvoice which includes data.